As a committee, the decision has been made that the Pte. Tyler W. Todd Memorial Hockey Tournament will not take place this year. The Todd family wishes to thank all our generous sponsors, participants, volunteers and community members for the tremendous support shown for this event over the last 8 years. We are extremely proud of the support we have been able to provide The Wounded Warriors in Ty’s name. These far exceeded our expectations. Thanks to you, Ty’s memory will continue to honour and support members of the Canadian Armed Forces. 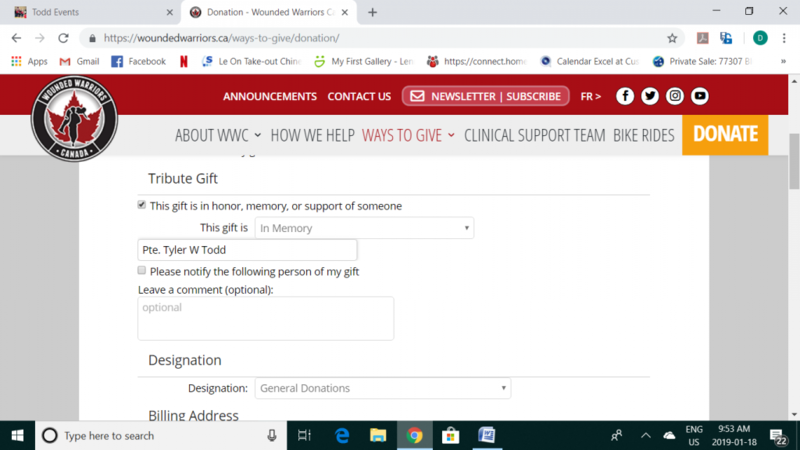 If you wish to continue your support to Wounded Warriors this year, please see the information below to make a donation in Ty’s name directly to Wounded Warriors, or you can contact us at 519-532-8017. If you have any questions or concerns, please contact us at toddevent@gmail.com.